"Lucidity and symmetry are the beauties most prominent in Jimmy Heath's tenor-saxophone playing. He is, indeed, one of the most endearing and persuasive jazz masters. " Born in October 1926, Jimmy Heath was the first of the Heath brothers to take up music. He first played alto in his high school days, and didn't switch to tenor sax until 1951. He notes two reasons for that move: there seemed more demand in bands for tenor players; and he was finding the affectionate nickname of "Little Bird," which fellow musicians had given him as a compliment, to be more in the nature of a drawback. Thus Jimmy can be listed (along with John Coltrane and many others) as among those who moved away from alto to tenor because they felt--in one way or another--the shadow of Charlie Parker across their path. Eventually, though, Heath stayed with tenor for the best of reasons: he found he preferred it! One of Jimmy's first regular jobs was with the Nat Towles band, working out of Omaha in 1945-46. He returned to Philadelphia to help his brother Percy, who had by this time become interested in music, with his studies. The two studied, practiced and then worked together, and it was also at this time that Jimmy got his first opportunity to write and arrange--for a local big band he formed, with sidemen including Coltrane and Benny Golson. In 1948, both Jimmy and Percy toured this country and Europe with trumpeter Howard McGhee; the following year bothe went over to Dizzy Gillespie for a two-year stay, after which they toured extensively with a "Symphony Sid" all-star group (Miles Davis, J.J. Johnson, Milt Jackson, Kenny Clarke). 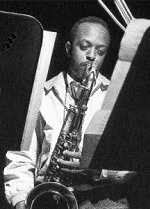 Jimmy has also co-led a group with Kenny Dorham; and in the Summer of 1959, when Miles was briefly without the services of Coltrane, he quickly called for Heath. In the recent past, Jimmy Heath tunes have been featured and recorded by Miles, Dizzy and Chet Baker, and he is now concentrating to an even greater degree on writing. Two of his compositions appear on Riverside on the Blue Mitchell album Blue Soul, which also marked Jimmy's playing debut on the label. A selected discography of Jimmy Heath albums. On The Trail, 1964, Riverside. Picture of Heath, 1975, Xanadu. Little Man, Big Man, 1992, Verve.